Green Building starts with reviewing the homesite to ensure site clearing minimizes environmental impact. 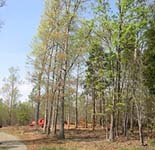 Large trees and natural areas were flagged for saving. Cleared small trees and branches were then chipped and the mulch placed on the homesite to keep the soil stable and prevent erosion from stormwater runoff. 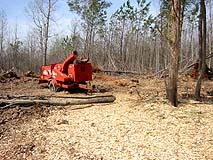 Larger trees were stacked into a log pile to be used as fuel for the home later. Footings were dug and poured. 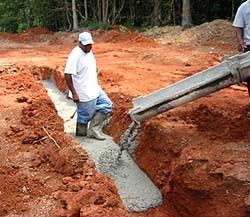 After meeting with Ron Williams of Pro-Site Services it was recommended we use larger footings than standard code. This was due to the site having volcanic outcroppings that could lead to potential shifts in the soil in future. Wider and deeper footings structurally would be more stable long term. 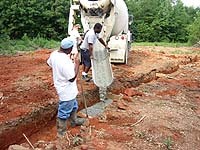 Using a little more concrete now is a greener choice to save energy in future with costly repairs and provides a more durable and solid home.